Healthy nails are characterized by a pink or flesh-toned color, so it is understandable why the appearance of white spots on them may raise some concerns. Leukonychia, derived from the Greek words leuko (“white”) and nychia (“nails”), refers to the white discoloration on nails. White spots are usually harmless, but in certain cases, they may be symptomatic of an underlying health condition. One of the most common causes of white spots on fingernails is minor injuries. Our hands allow us to perform everyday tasks, so an injury to fingernails is likely to occur, even when we do not feel pain. However, because we use our hands so frequently, it can be difficult to identify the exact instance of injury to our fingernails. A study describing different types of abnormal coloring on nails of Korean patients indicated that nail-biting, frequent manicures and work-related injuries were the major sources of injury-induced white spots. The study also found that skin-related diseases and systemic diseases are often associated with white spots on nails. Psoriasis (characterized by scaly, itchy rashes) and alopecia areata (marked by hair loss) were the dominant skin-related diseases, while anemia (low red blood cell count) and chronic kidney failure were the major systemic diseases linked to white spots. There is a popular belief that white spots on nails result from nutritional deficiencies, specifically in calcium. This claim was made without much evidence. However, there are some studies suggesting that deficiencies in zinc and selenium may play a role in the development of leukonychia. Observing the frequency and number of nails covered by white spots can be helpful in gauging the severity of the situation. If a single white spot presents itself on a single or a couple of nails, it most likely occurred from trauma and would not necessarily raise any alarms. If several white spots present themselves on a majority of the nails, the white spots may be associated with skin-related diseases. 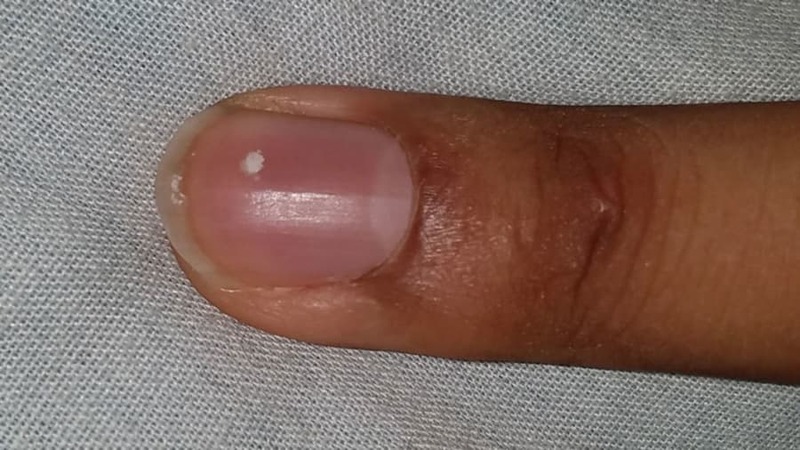 In cases where about half of the nail or the entire nail becomes white on almost all of the nails, a disease that affects important organs such as the liver or kidney could be the culprit. White spots on fingernails may not be the most pleasant to look at, so what can you do to remove them? For injury-induced leukonychia, the spots will disappear after about 6-8 months which is the length of time it takes for a nail to regrow. As for the possibility of skin-related diseases, systemic diseases, or nutritional deficiencies being the cause, a proper diagnosis would be required in order to develop an effective treatment plan. While there doesn’t seem to be a quick fix for white spots on fingernails, simply protecting the fingernails from injury and being mindful of one’s health can help reduce these spots from forming.